high – the application will use the most part of the resources of the system – the most efficient mode for the program. However, other programs, launched in the system, can operate with the significant delay in the performance. Number of threads. The program automatically determines the number of processor cores and creates the corresponding number of threads. That can also be adjusted manually. Default path for dictionaries and sets of rules. Indicates the location of dictionaries and rules on the hard drive. Default folder - "/data"- installation folder of the program. 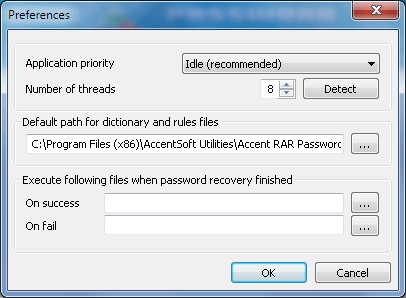 Execute following files when password recovery finished. Determines files that the program shall start (usually it's sound files) when the launched process of password searching is completed. You can determine different files for successful and unsuccessflu searching.